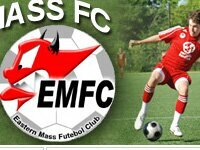 Eastern Mass FC is committed to providing the finest soccer experience in a friendly, safe, and rewarding environment. We teach the fundamental skills, and develop athletes through organized teams, league competition, tournament play, excellent training and quality coaching. We believe that all of our members are winners, regardless of playing ability. We believe strongly in diversity and helping the game reach all players in both the inner-cities and towns. Everyone is afforded an equal opportunity to maximize their full potential and pursue positive outcomes on and off the field.